Critical condition of a bow-shock instability was experimentally investigated for a low specific heat ratio flow in a ballistic range with different gas species and Mach numbers. Unstable shock surfaces were observed in front of an edged blunt body by shadowgraph images as predicted in advance by numerical simulations, and a disturbed flow appeared in the downstream even if the flow condition was close to the critical one. A numerically predicted critical curve in a parameter space of specific heat ratio and Mach number indicated that the instability can be found in a low specific heat ratio and high Mach number flow, being consistent with the present experiments. 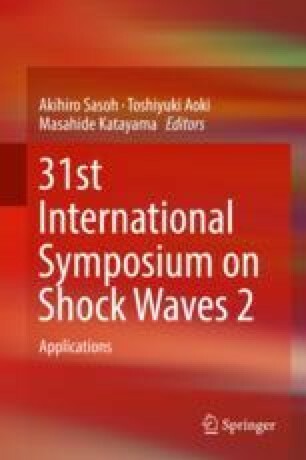 The density ratio of 10.5 across the shock front is similar to the critical curve; therefore, larger one may be an ingredient to make a bow-shock wave unstable.